DNA methylation is a process by which methyl groups are added to DNA. Methylation modifies the function of the DNA. When located in a gene promoter, DNA methylation typically acts to repress gene transcription. 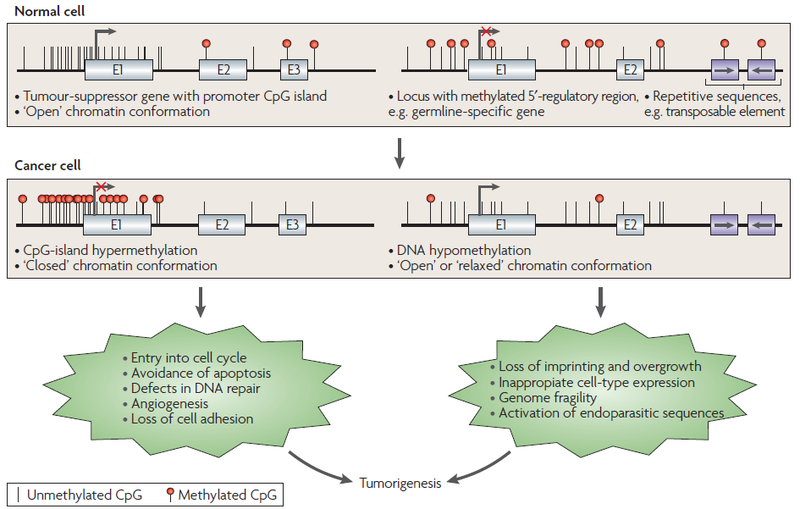 DNA methylation is essential for normal development and is associated with a number of key processes including genomic imprinting, X-chromosome inactivation, repression of repetitive elements, and carcinogenesis. DNA methylation at the 5 position of cytosine has the specific effect of reducing gene expression and has been found in every vertebrate examined. In adult somatic cells (cells in the body, not used for reproduction), DNA methylation typically occurs in a CpG dinucleotide context; non-CpG methylation is prevalent in embryonic stem cells, and has also been indicated in neural development. 1) Not all genes are active at all times. DNA methylation is one of several epigenetic mechanisms that cells use to control gene expression. 2) 5-azacytidine Experiments Provide Early Clues to the Role of Methylation in Gene Expression. genomic instability that characterizes tumours. E, exon.